This recipe is super easy to make, quick to clean up and refrigerates nicely if there are any leftovers. Win win win. Thanks to Heidi (one of my roommates in my single-and-fancy-free days) for the recipe! Preheat oven to 450 degree F. Melt butter in 9×13 pan. I usually do this in the oven as it preheats but you can melt the butter the microwave and pour it in the pan. Blend the eggs for 4 minutes in a blender. Add the flour, milk, sugar, salt and blend again for 1 minute. Pour the mixture into the prepared pan with the melted butter already in it. Bake the pancake for 15 minutes and watch it grow as it bakes. It will be big when it comes out of the oven and deflates as it cools. Slice and serve warm with powdered sugar (my family’s favorite ), fresh fruit or preserves. I came across this easy donut recipe from onsugarmountain.com and instantly put it on deck to make with Adelaide. So … we did this Saturday when we finally had a lazy morning while Daddy was out golfing and Oliver was taking an amazing God-knew-I-needed-it long nap. These donuts were super easy to make and really good. We ate them plain and then had to stop ourselves so we would have some to eat with frosting. I have a donut baking pan so that’s what I used but a mini donut maker would work fine, too. You’ll also see my substitutions. Since I live in Tobago, I often don’t have all ingredients but I always find a workaround. Preheat your oven to 350 degrees and spray donut pan with cooking spray. Add all ingredients to a mixing bowl and beat with electric hand mixer until the batter is smooth. Pour donut batter into a ziploc bag, then cut the corner to pipe donut batter into your pan. I fill it a little less than half full to get a good donut shape (and it’s easier to come out of the pan). Bake for about 5 minutes, or until a toothpick inserted into a donut comes out clean. Whisk together sugar and cream/milk until a thick glaze forms. You can adjust the amount of heavy cream to get the right consistency. Dip half of donut into frosting, then cover with sprinkles and let sit until dry. If awesomeness were measured by pages I think 540 PAGES in the Borg Family Cookbook is a close indication of how awesome my family is. What else is awesome? The Hootenanny German Pancake on page 70 and my cousin Kelli Rivera’s description of the breakfast delight. 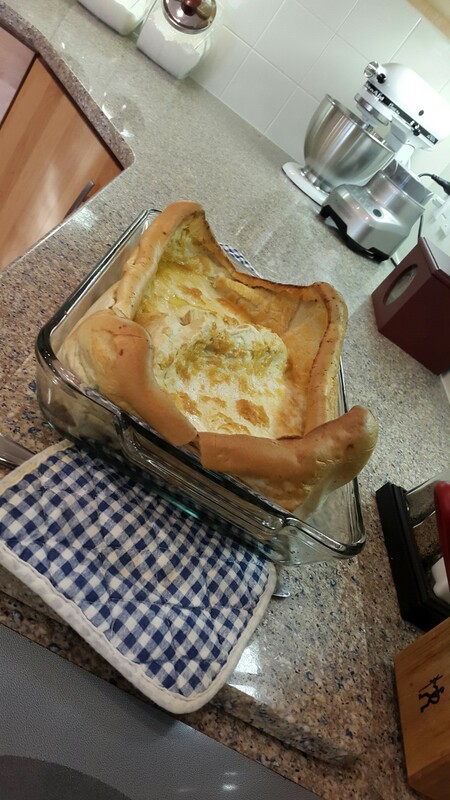 My kids love how the Hootenanny German Pancake rises up all crazy. 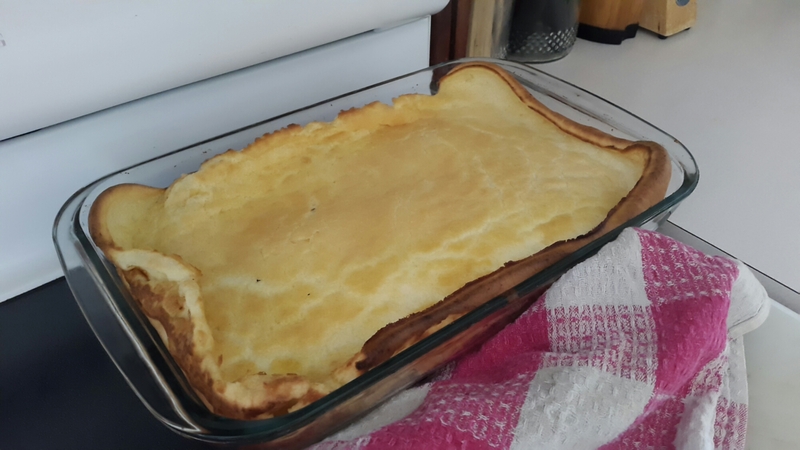 Pour the melted butter in a 9×13 baking . Beat the eggs, milk, salt, cinnamon, vanilla, and nutmeg until frothy. Whisk in the flour until well combined. Pour over the melted butter in the baking dish. Do not stir. Bake for 25 minutes or until the center is set and the edges arebrowned. Serve with maple syrup or powdered sugar and fruit. Today I felt like cheese and my mother’s muffins — the ones I craved when I was young. Mmmmm. These Cheddar Biscuits are a good combination. The fact that they are super easy to make is a major bonus. In a large bowl, combine milk, melted butter, egg & cayenne.